EdIT Summer School, a true simulation of a real software project, has finished for 2015. 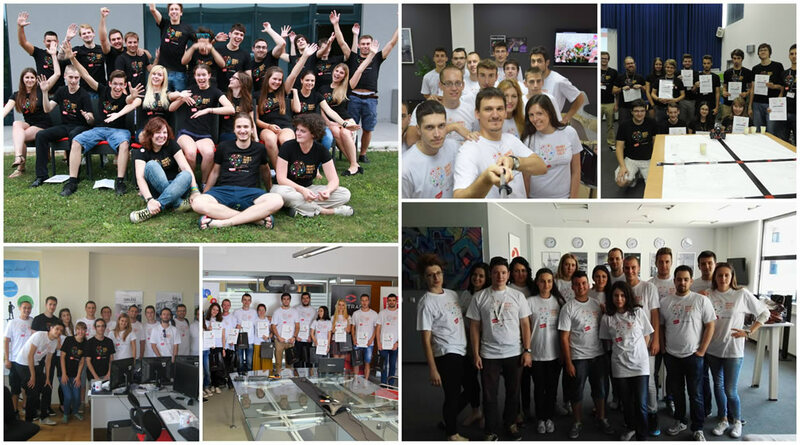 More than 50 Comtrade employees in six locations have been involved in organizing EDIT for 19 consecutive years. Participation at EDIT Summer School offers young professionals the unique experience of large software project simulation. The team members are faced with a concrete task that has to be carried out in a limited time of two weeks and presented to a broader audience. The whole team contributes to the result. EDIT is primarily intended for students who wish to supplement their academic knowledge with practical experience. EDIT lasts two weeks in six locations. EDIT participants have been able to test their teamwork skills within a diverse group of students with different backgrounds, knowledge, and project behaviors. EdIT is an ideal place to test how to implement your knowledge to solve problems as part of a group. Participants also learn the latest on different technologies, but also something about: managing projects using agile methods, the lifecycle of software solutions, and team work. 2015 EDIT Participants have excelled at innovative approaches to problem solving and creativity in their presentations. Well-visited final presentations discussions were challenging and interesting. Violeta Bulc, European Commissioner for Transport, attended the presentations and participated in discussions on Mobility as a Service (MaaS) and Sustainable Mobility for the City of Ljubljana as a part of dialogue with citizens. The commissioner was surprised that EDIT15 students offered some incredible solutions to modern mobility challenges, and how tightly aligned they were with the transport strategy and strategy of mobility of EU. “There is hope for Europe because young people are already thinking strategically,” she added in the end. One challenge for EDIT15 participants in Kragujevac was to develop a user application to monitor roads, traffic, and accidents. There were 12 participants divided into three or four member teams. Each of the teams worked separately on the same solution. Participants used the SCRUM methodology for the first time that enabled them better conduct in the project. When working on this solution the participants had the opportunity to go through the whole software life-cycle working with technologies such as ASP.NET (backend), HTML5, and AngularJS (frontend). Participants demonstrated a client web application with a video overview of a selected area or route, an exact position on the map, and other data that correspond to the existing video view. EDIT15 team in Banja Luka presented a video player that allows the user to search videos via those annotations and get reference to a video and point in time. The goal of the project was to create a HTML5 video player that offers users the ability to add some helpful annotation with icons and custom text at a certain point in the video. This frontend side of this solution is based on HTML5, CSS3, Angular, with NodeJS and MongoDB on the backend side. After two weeks of work students were able to successfully finish their task in creating a functional video player with annotations, which was then presented to Comtrade Banja Luka employees with a great success. The goal was to develop a Single Page Application (SPA) that handles user’s appointments such as meetings, reminders, tasks, etc. within a Calendar. The EDIT Sarajevo team built an application which is focused on the Xalendar view, integrated with an existing backend API, as well as a cloud-based analytics service. Mixpanel provides the analytics API. An AngularJS framework has been used for the frontend business logic. The code scaffolding was provided by yeoman. Grunt was used to build the application, while Bower was used for easy dependency management. The main feature is the calendar which integrates with the backend, so existing data can be converted into events shown on the calendar. Integration with the analytics service enables insight into user behavior on the page, which shows, for example, how a user would most likely finish adding an event. On the final day, the EDIT Maribor team presented a multi-platform solution of a web shop with simulation of the robot system storage management with a help of a Lego robot Mindstorms EV3. The solution is based on JaveEE platform and on Angular JS web technologies. The participants were able to put together a working system that with a click to a web application, activates the programmable core of the robot in less than two weeks. After the order the robot physically takes the item from temporary storage and delivers it to the orders selection area. EDIT 2015 participants in Belgrade had to develop a user application for monitoring roads and traffic, the same as the EDIT team in Kragujevac, two weeks beforehand. The project goal was to display the selected area or route with an exact position on a map via a web application. When the application starts, it shows a selection of recorded routes that are located on the server. Different details are shown, such as the route name, start time recording, the length of recording, etc. In the second phase of the project, the server application saves the videos and related information. Visual Studio 2013 was a development environment and HTML5, CSS3, .NET, WEB API technologies were used. On the final presentation day participants showed us how, and in what way they made the application for monitoring roads and traffic. Each team presented its application. Applications have the same function, but different styles. The second team in Ljubljana, that was international with participants in Germany, presented two concepts of sustainable mobility for Ljubljana that are based on the system of public transportation and shared usage of vehicles. Users can utilize them in the form of mobility as a service (MaaS). Students set forth two main problems that Ljubljana is faced with – pollution and traffic jams. There are more than 100,000 daily workers coming to Ljubljana, 90% of them arriving with their own car. Team members presented the possibilities of which and how many of each service is needed to replace owned cars in the city.